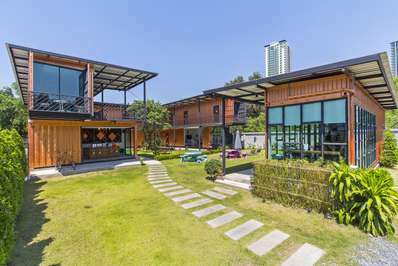 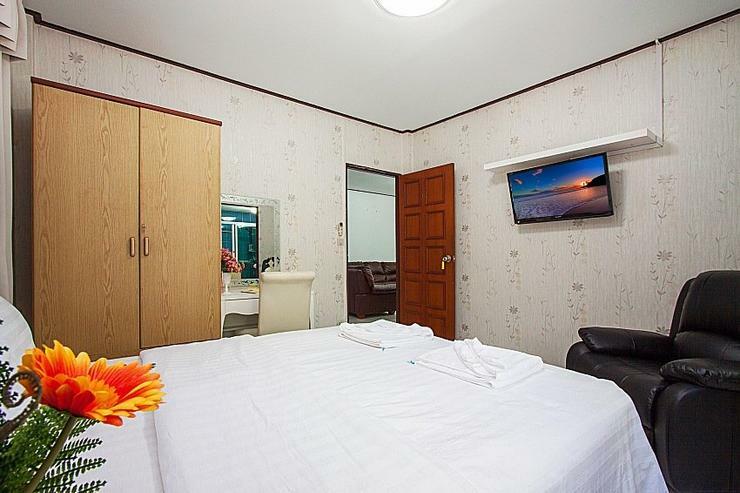 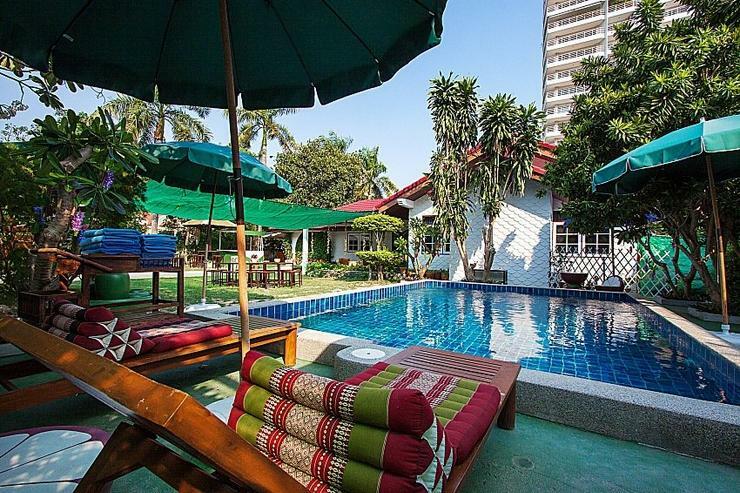 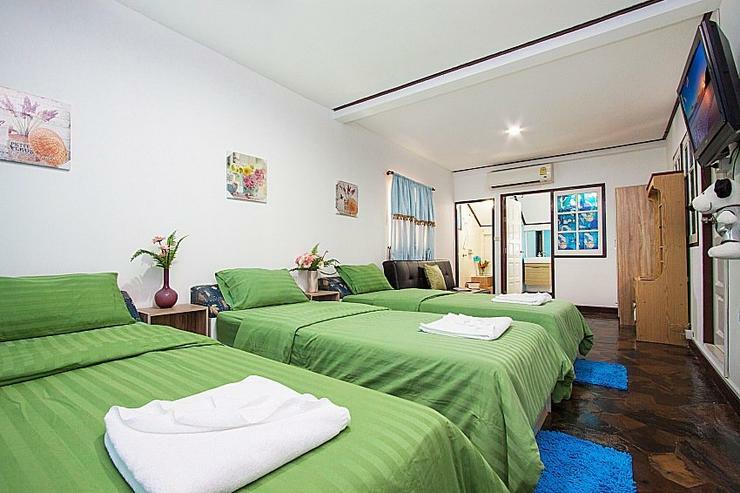 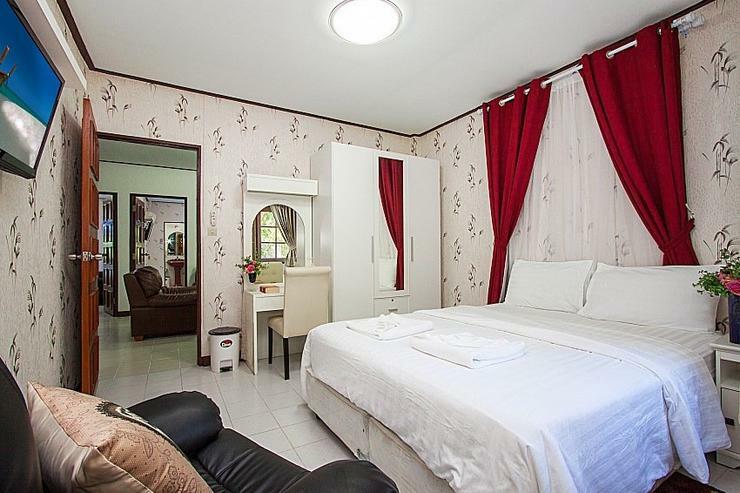 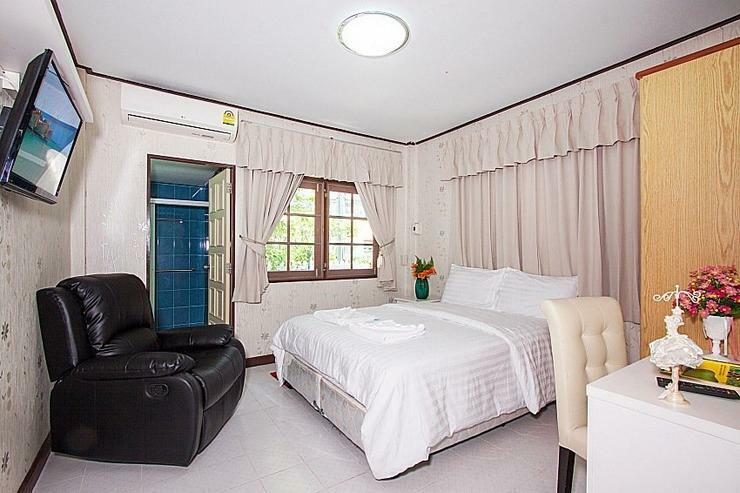 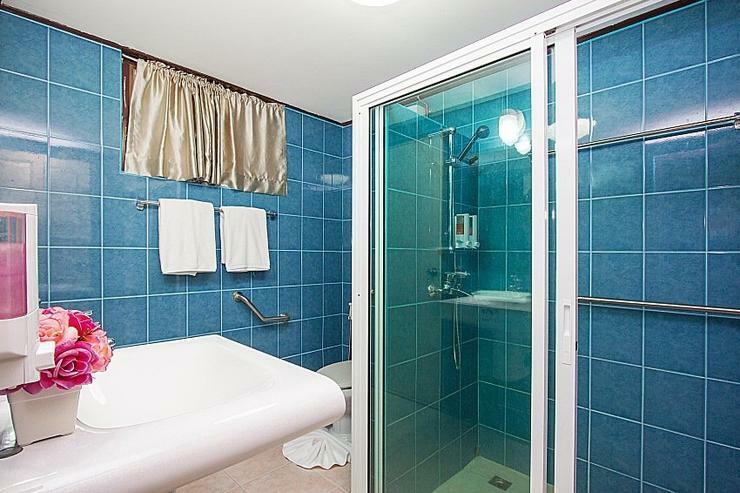 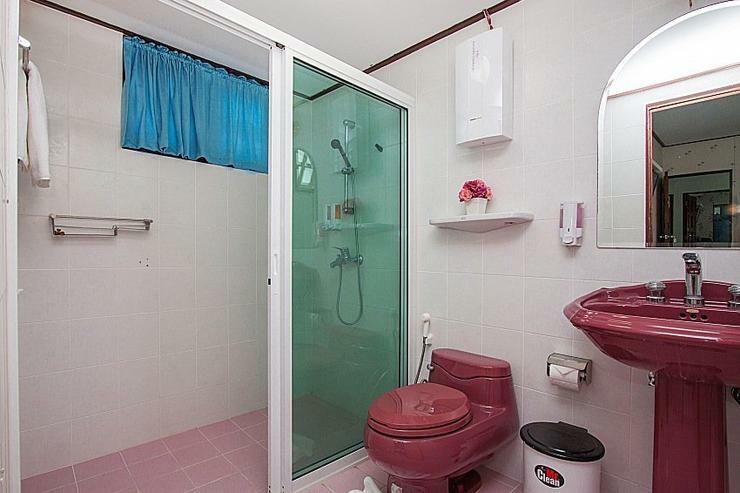 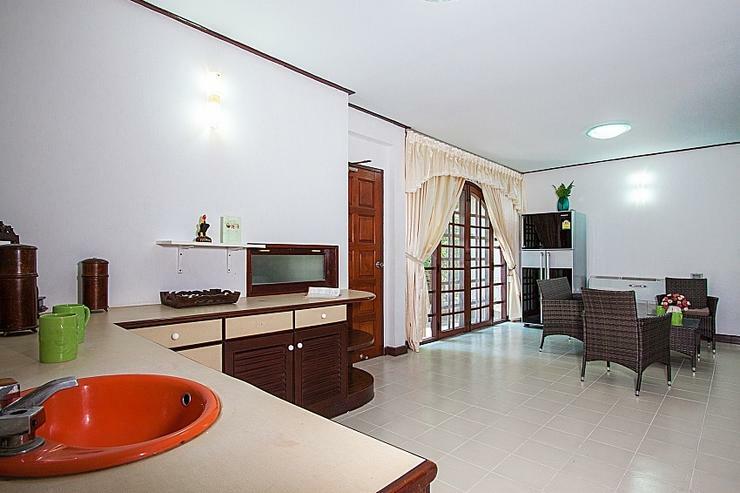 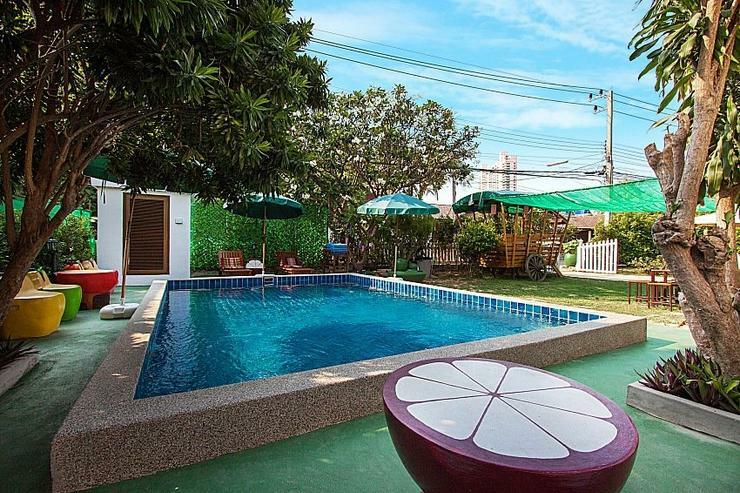 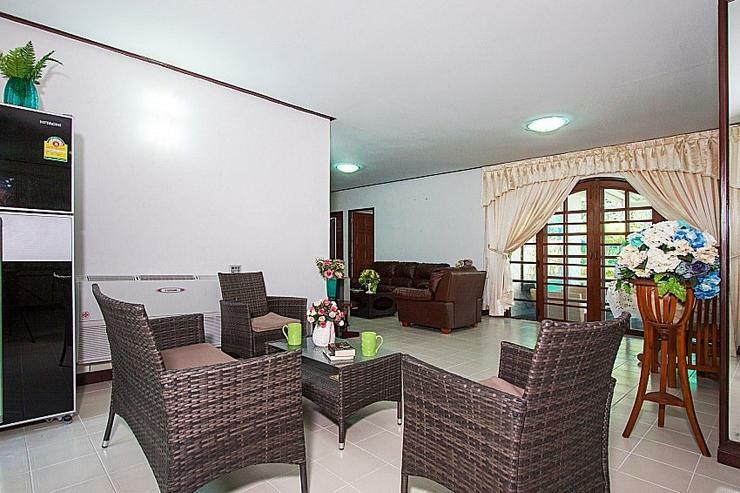 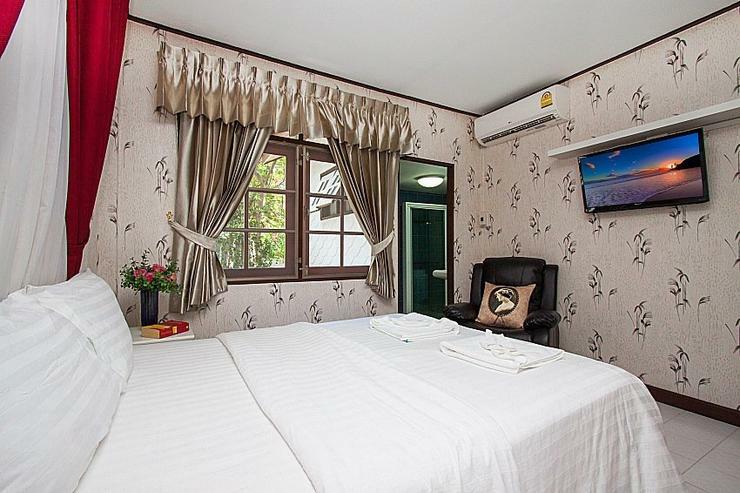 Set in a prime holiday location on a gated estate, just 400 meters from Jomtien Beach, and just a 5-minute drive to the back-end of Walking Street on Pattaya Beach Road, it doesn’t get more convenient for villa rentals in Pattaya. 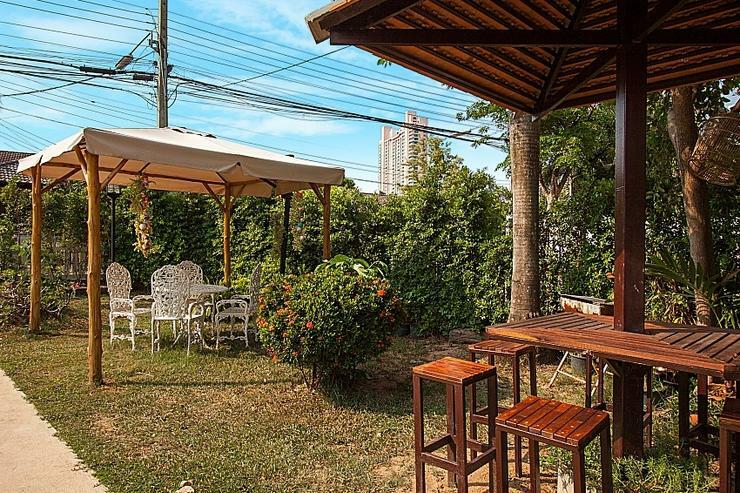 Being in Jomtien ensures that lots of the best international restaurants are just 200 meters away, alongside some excellent nightlife zones. 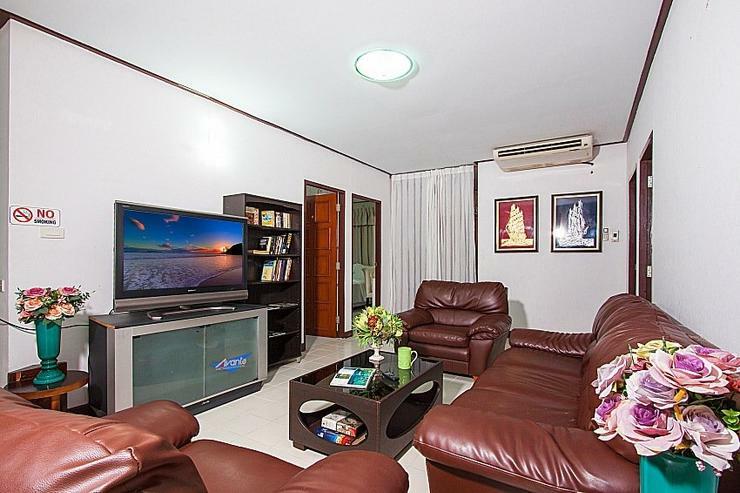 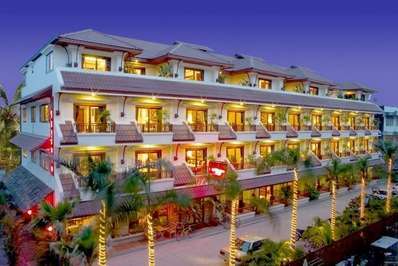 Jomtien is one of the best holiday locations in the region for families especially. 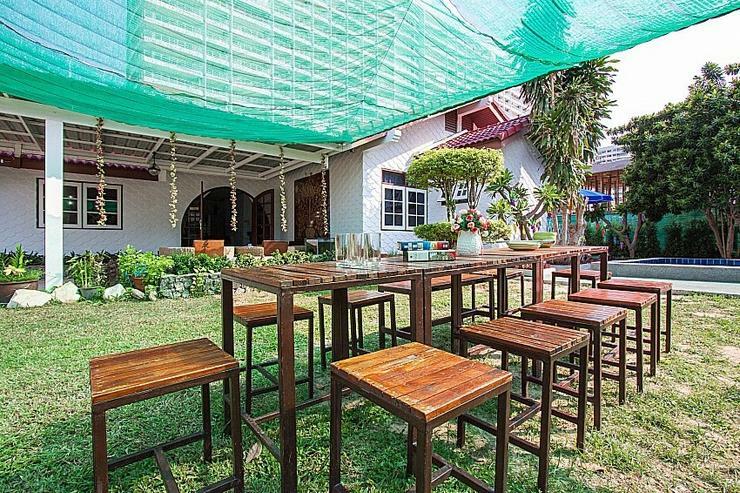 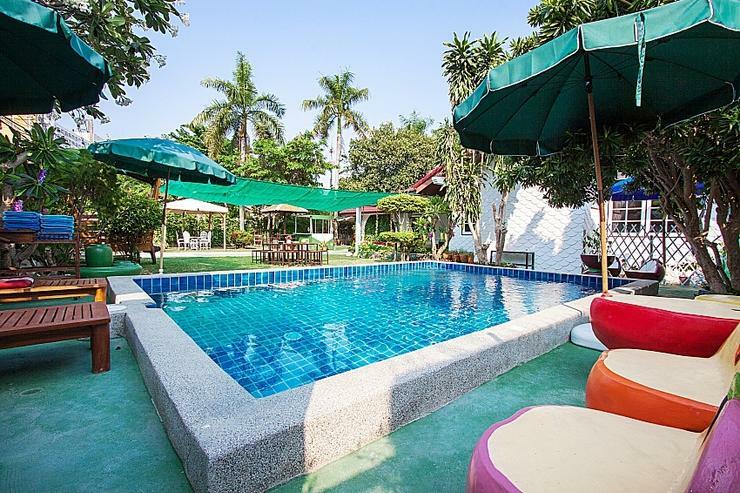 This 5-bedroom villa is situated in the perfect holiday location, close to lots of bars and restaurants and only 400 meters from Jomtien beach. 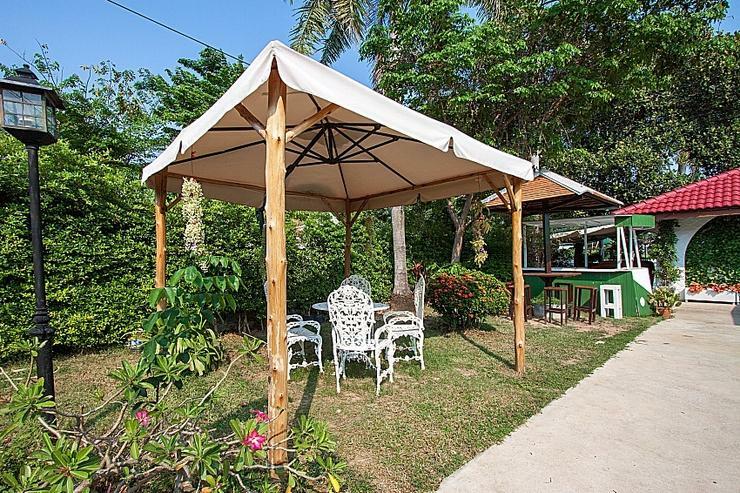 You can literally walk to the end of the estate and have lots of holiday amenities just across the road. 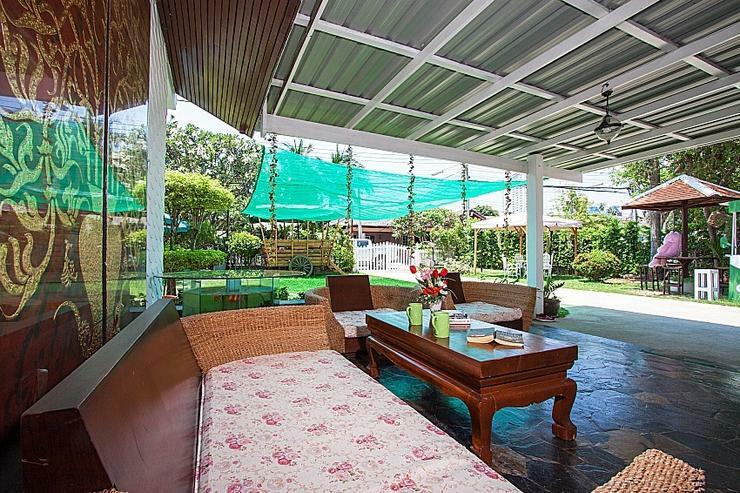 The villa has a large garden with turf lawns and lots of trees and seated areas, both in the sun and shade. 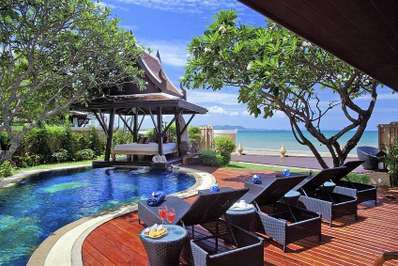 The garden has a private swimming pool, flanked by a large covered wooden Thai sala, perfect for relaxing amidst the Tropicana. 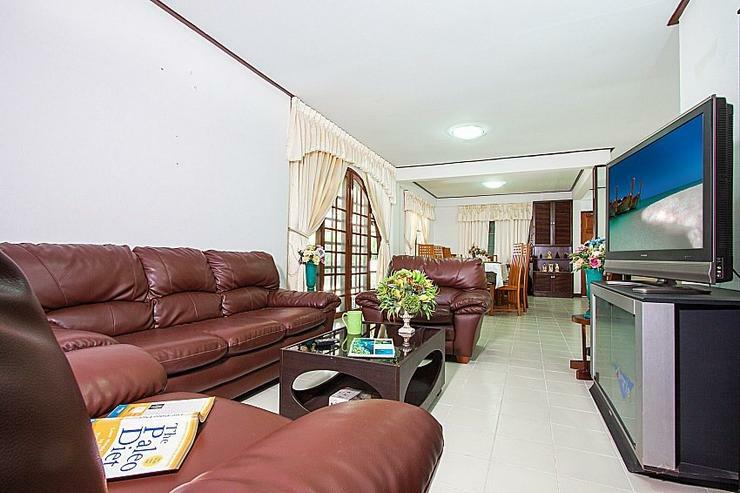 The lounge area is comfortable and enjoys views and access out to the garden, coming with air-conditioning, a large flat-screen TV with international channels, and a 3-piece leather settee. 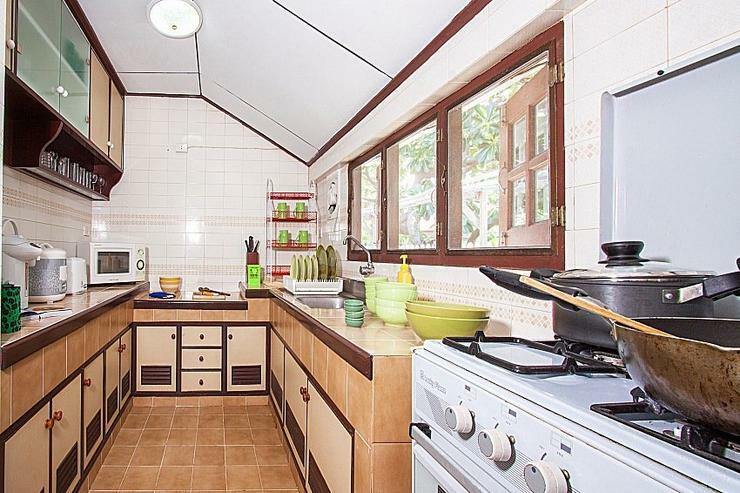 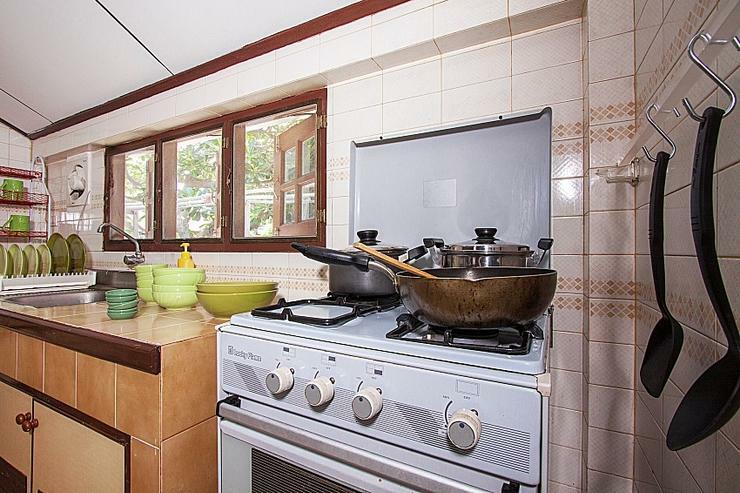 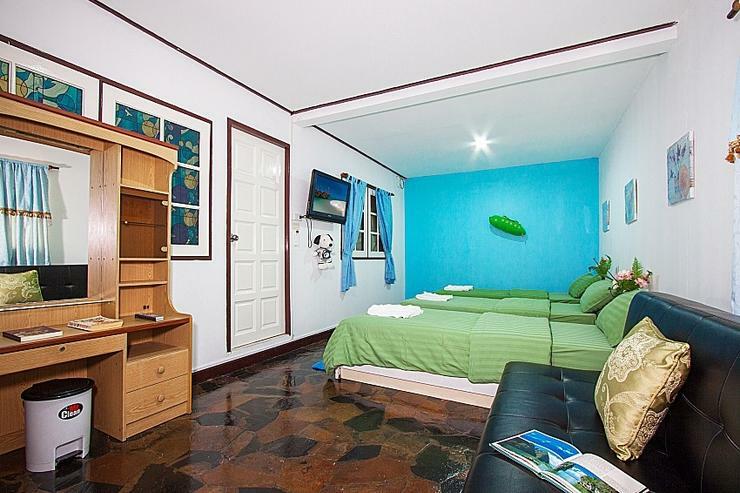 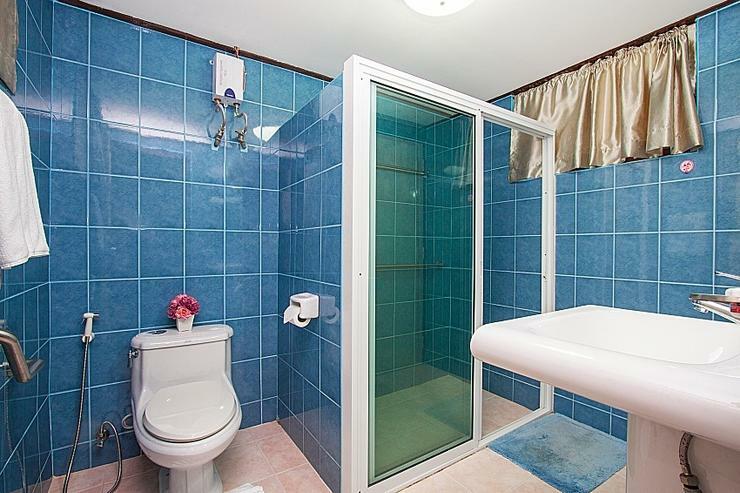 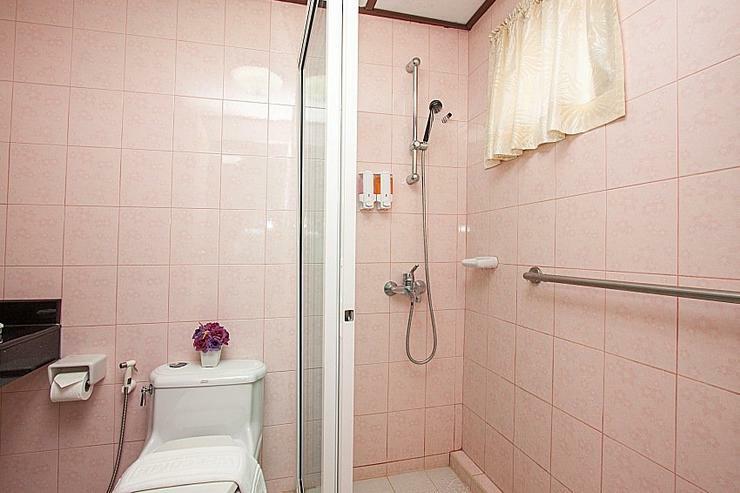 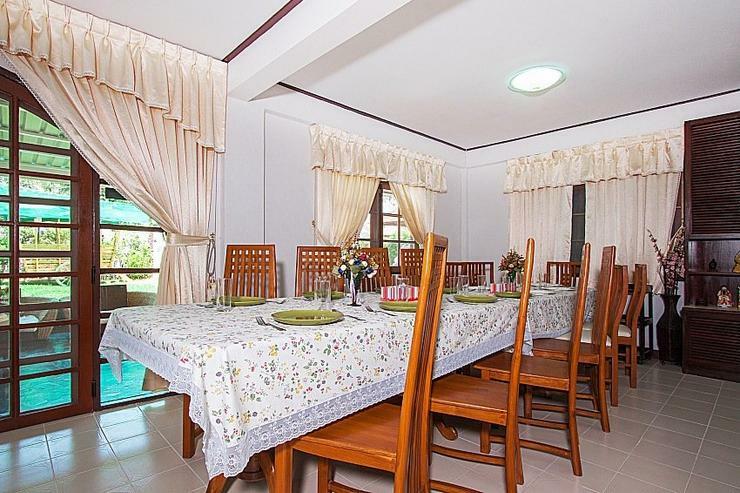 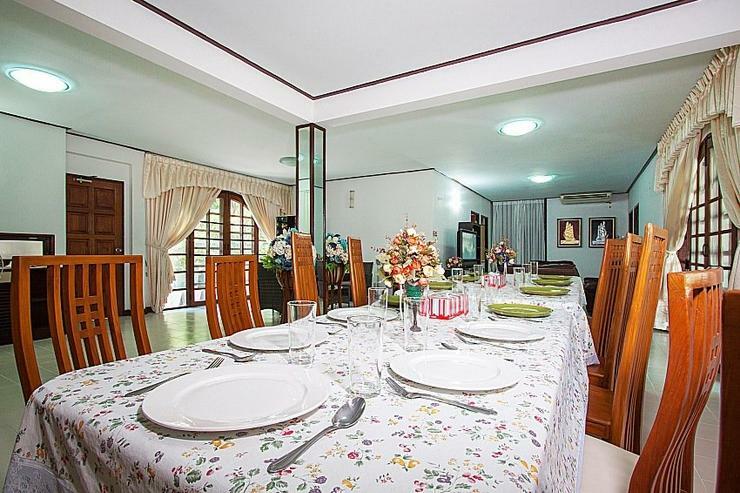 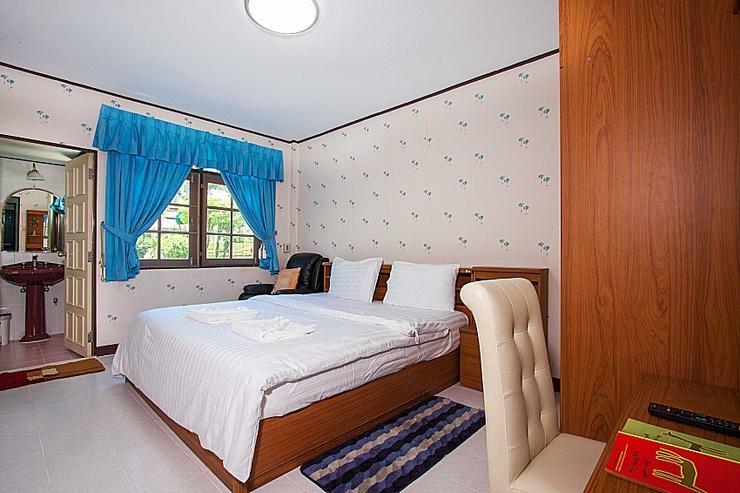 In this area, you will also find a 13-seat wooden dining table and a fully-equipped kitchen with lots of appliances. 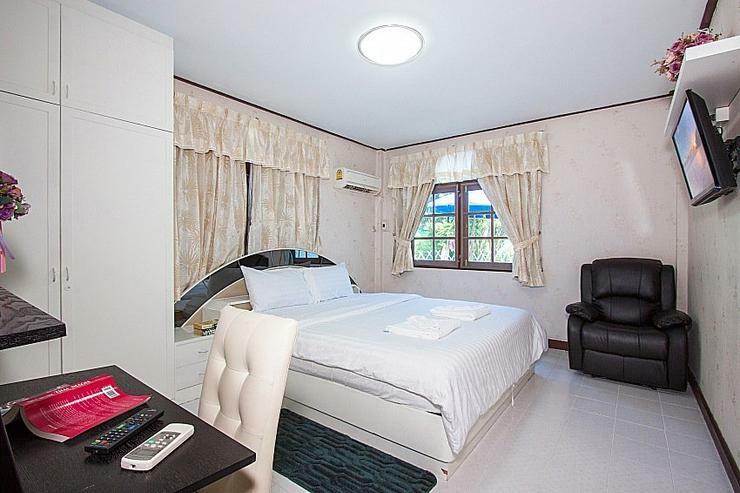 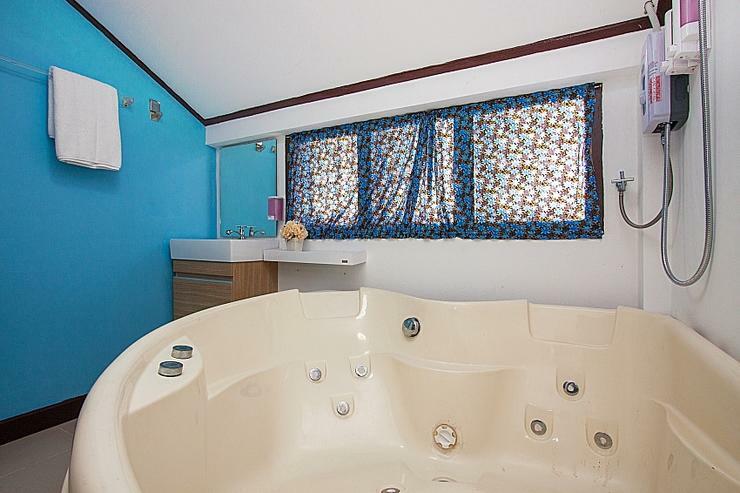 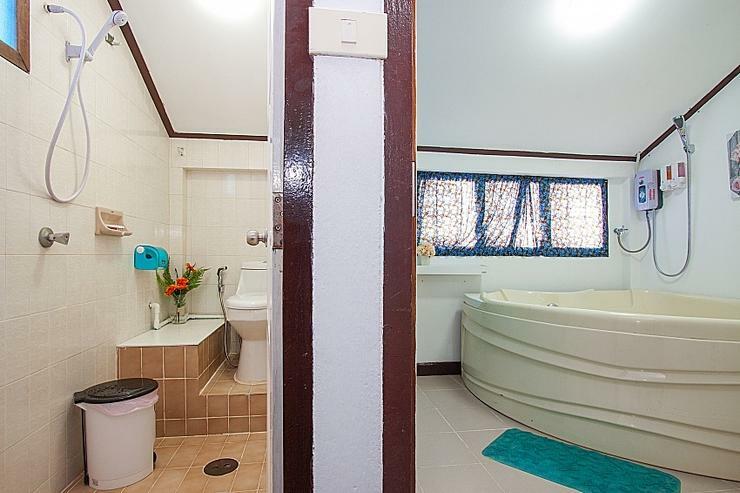 The 5-bedrooms sleep 11 people in total, all coming with televisions, air-con, wardrobes and either access to private bathroom or close to one. 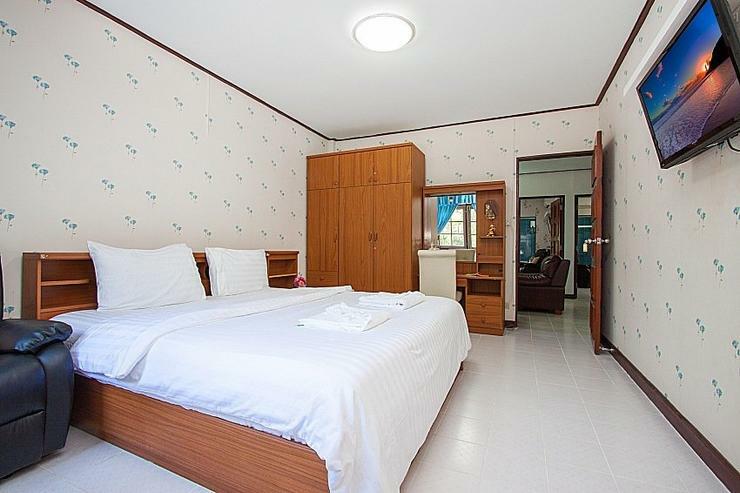 There are double beds in 4 of the bedrooms, while there are 3x single beds in the 5th room, perfect for families and large groups. 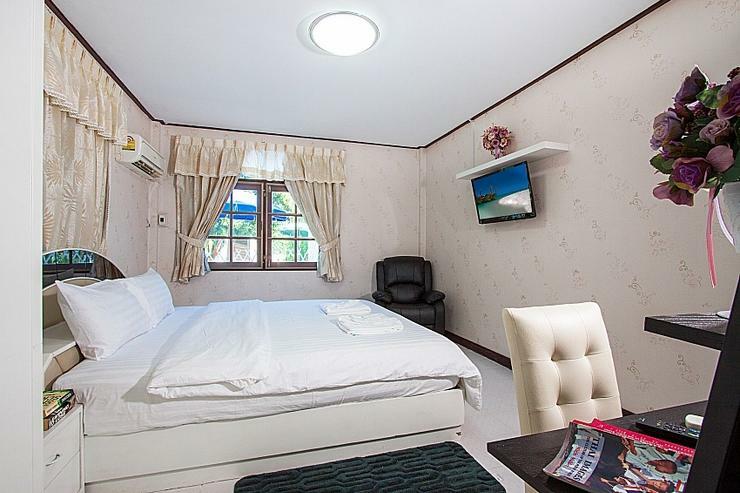 The location, just 400 meters from Jomtien Beach, is very central and just 200 meters from nightlife zones and a fantastic choice of international restaurants. 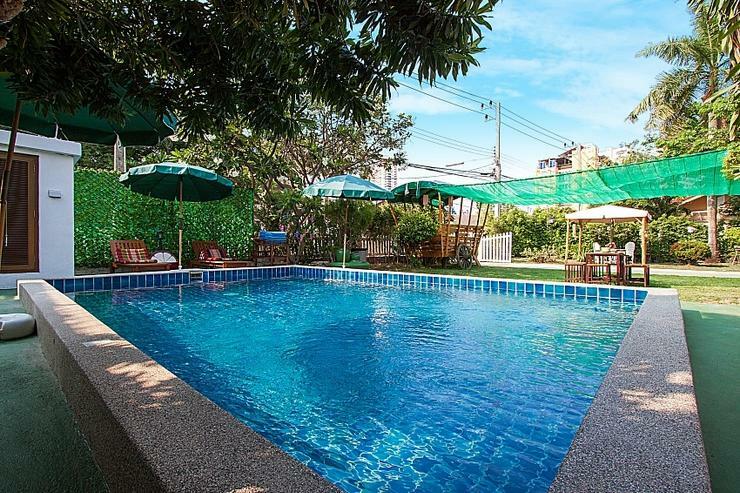 With Jomtien beach so close, and Walking Street Pattaya just a 5-minute drive, it doesn’t get better.